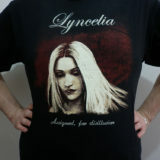 1 color Lyncelia “Assigned, for Disillusion” logo. Soft and comfortable Black T shirts brand “Fruit of the Loom”. 28 cm printed Logo. Available in sizes M, L, XL. Soft and comfortable Black T shirt brand “Fruit of the Loom”. 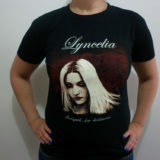 28 cm printed Lyncelia Assigned, for Disillusion Logo. Shipped within 2 days on priority mail.